Well, one of those finds--I'll write about five more in the coming weeks--is the Sega Genesis 2 system (and controller) seen in the following photo. I don't expect Pier Solar to be the only game that gets stuck into my recently-rediscovered Genesis 2 this year, of course; I also expect to slide copies of Shining in the Darkness, Shining Force, Shining Force II and Landstalker into the system's cartridge slot at some point or other. Before I purchase those titles, though, I'm going to have to get one of those slick, six-button controllers, since I've never been much of a fan of the cheap, chunky, three-button ones. Amen about the controller. I think three buttons in a row make my brain work too hard at something that should be fun. Of course, I was raised on two buttons side-by-side...so maybe that's the problem. Anywho, exciting for you! But wouldn't the six-button controller be even worse for you, Justin? Anyway, one thing I like about the six-button Genesis controller is that it's a bit smaller than the three-button one. The three-button ones are so big! This is a fantastic find, looking forward to hearing your opinions on some classic Sega titles in the future! Nice find. I was a Megadrive kid myself. Was always envious of SNES owners but stuff like Gunstar Heroes and Rocket Knight Adventures more than made up for it. You should definitely get GH and Dynamite Headdy, they're pretty much essential. Also not a fan of the 3 button MD controller, the 6 button one is much better. I'll have to get one myself. Took the MD out of the attic a while ago and it was working fine but the controllers were really in bad shape. I'll need it to play my own copy of Pier Solar. Hey there, Retr0gamer! It's funny that you say you were a Mega Drive kid. I was a SNES kid myself! Well, actually, I was a TurboGrafx-16 kid, first and foremost, but I loved my SNES, too. I think I bought this Genesis while in college, so quite a while after it was released. I know I had some games for it, too -- Gunstar Heroes among them -- but I must have sold them at one point. Oh, well. I'm glad to hear I'm not the only one who hates the original three-button Genesis controllers. They're so big and cheap! Six-button controller, here I come! I wouldn't be at all surprised if it were the size that bothered you, Justin. The three-button Genesis controller is a BEAST! Ick. The six-button one is just easier to hold, IMO. 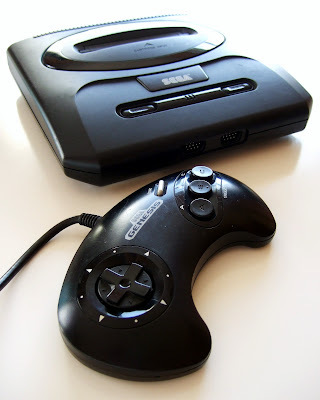 Since I got my Mega Drive 2 years ago I`ve been very impressed by it. I never had one back in the day but it really is a great console. Enjoy! I left a lot of old systems and games in my old bedroom after I moved out of my parents' house, Sean, and that was quite some time ago. Some of them I remembered, some of them I thought I had sold and some of them I forgot completely. For some reason, I had a vague memory of buying the first Genesis model, but not this one. How weird is that? How many MD games do you have, by the way--and which ones are your favorites? I can honestly say that I disappointed in myself that I gave away my sega genesis and all its games when I got to college..aaaaapparently, booze and girls were more important. We all did some pretty stupid things in college, Blake--or at least I did :P Plus, I'm guessing you could buy another Genesis now if you wanted, right? Love this series of posts, can't wait for the next! Ah, you and I are too much alike, Darwin. Why did we let some of these treasures go? Argh! I still regularly beat myself over the head for getting rid of my Saturn (both of them) and my TG-16+CD. Never again!